Deutsche Bank headquarters in Frankfurt, which was among the bank’s offices searched by the police and prosecutors on November 29 in a money laundering probe.After working feverishly for months to accelerate a turnaround plan for Deutsche Bank AG, chief executive officer Christian Sewing has hit a wall. On Thursday, a day after he gave a pep talk to management, the bank’s headquarters including offices of its entire management board were searched by police. The shares fell to a record amid the prospect of yet another costly probe, this time related to disclosures from the Panama Papers. Days earlier, the company was sucked deeper into another money laundering scandal at Danske Bank A/S. The events threaten to accelerate a negative feedback loop of falling revenue, declining morale and rising funding costs. While many of Deutsche Bank’s largest investors, contacted before the raids, said they still back him, they argued he only has another quarter or two to prove his approach can work. At the same time, strategic alternatives are getting ever more painful for shareholders because of the low stock price. As the 148-year-old institution continues its stumbles, here’s a look at some scenarios how it may play out. Sewing took over in April with a mandate to accelerate cost cuts, but he has recently emphasised efforts to invest again in growth after years of falling revenue. Still, additional savings aren’t entirely off the table. The CEO said privately that he’ll review his strategy if it’s becoming clear that it’s not working, a person familiar with his thinking has said. His current plan has set only vague targets beyond 2019 and investors will likely soon demand more detail. Further reductions to the US operations would be welcome, two large investors said asking not to be identified discussing individual investments. Wherever the bank will shrink, it won’t be at the expense of revenue, chief financial officer James von Moltke has said. Many top executives agree it could make sense for the two to join at some point, according to people briefed on their thinking. But they also say a tie-up would be difficult as long as both banks are locked in multi-year turnaround programmes. The long, painful decline in the share price of Deutsche Bank, the larger of the two, is another obstacle, though it may make a deal more palatable to Commerzbank. The biggest obstacle to such a scenario, again, is Deutsche Bank’s low share price. 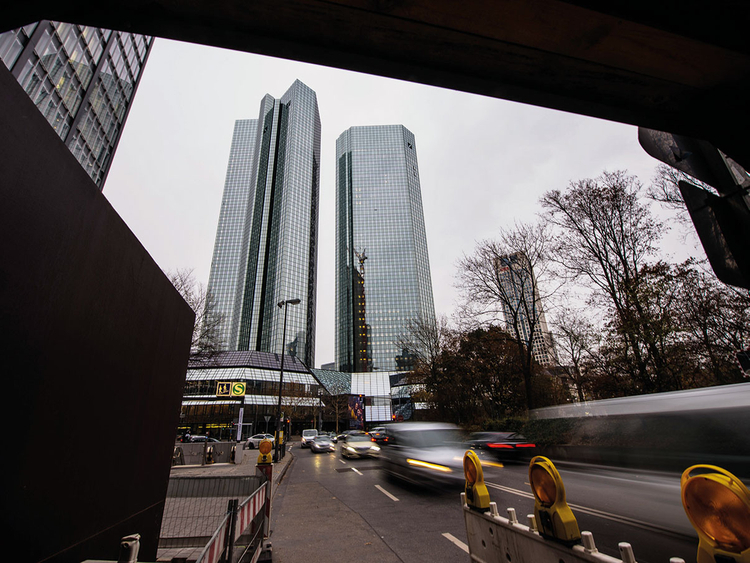 Any deal at the current valuation means Deutsche Bank may end up as the junior partner. UBS’s market capitalisation, for example, is more than twice as high. A higher share price would open more strategic options for Deutsche Bank, a key reason why top management is opposed to making a decision too soon, according to one of the people. A holding structure would also make it easier to split up the bank into a retail lender and an investment bank. A proposal to do so was tabled at the last annual general meeting in May. Although Deutsche Bank’s management board recommended voting against the proposal, arguing that splitting the bank would damage the business, it still received more than 5 per cent of the vote. There’s still a chance that no change in plan will be needed. Some regulators and several investors agree that it will be hard for the bank at the current juncture to pull off a deal that radiates strategic vision rather than desperation, the people said. If Sewing manages to stabilise earnings — despite the fresh headwinds — investors may regain confidence. Sewing has won the backing of Doug Braunstein, the former JPMorgan Chase & Co. finance head whose Hudson Executive Capital LLP in early November revealed owning a 3.1 per cent stake in Deutsche Bank. Deutsche Bank’s shares should end up trading about three times higher than their current level if Sewing’s plan succeeds, Braunstein said at the time, and a merger with another bank isn’t needed to achieve that.